Virginia Railway Express (VRE) has completed a new third track between Hamilton, near Fredericksburg, and Crossroads in Spotsylvania County, Va. This important capacity enhancement project on CSX Transportation’s (CSXT) railroad, on which VRE runs, went into service on Tuesday, May 17, 2016. It was completed in conjunction with the recently opened Spotsylvania VRE Station, and also included an upgrade to the railroad crossing at Mine Road. 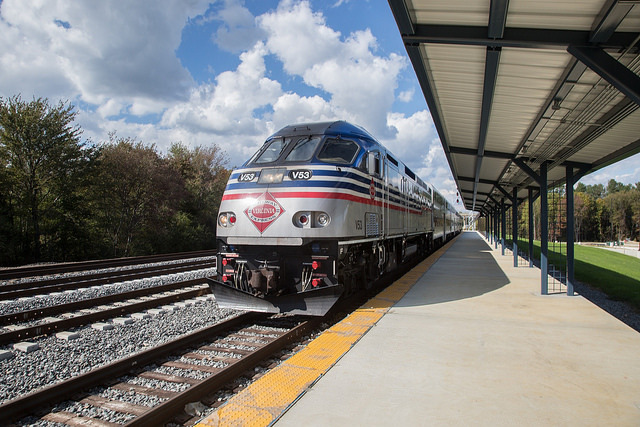 “The addition of a third track will increase capacity and fluidity, and provide operational flexibility on the rail line that hosts VRE and Amtrak passenger service in addition to CSXT freight trains,” said VRE CEO Doug Allen. A combination of federal, state, and local Government funding, along with a contribution from CSXT paid for the project. “This is another example of how well VRE and its partners, CSXT and Virginia’s Department of Rail and Public Transportation (DRPT), work together to complete projects that improve operations for all of the trains running through this corridor,” Allen said. VRE is the tenth largest commuter rail service in the U.S. and is a transportation partnership of the Northern Virginia and Potomac & Rappahannock Transportation Commissions. It provides more than 4.5 million rides annually in northern Virginia and Washington D.C.